One thing we all should know about singer/songwriter, Tinashe, is that she's extremely dedicated to perfecting her craft as an artist. She has made it clear that she enjoys working more than anything else; she loves to create music and she especially loves to perform and link up with her fans. She has evolved from the days she spent creating mixtapes in her bedroom studio back in 2011 to now preparing for the release of her sophomore album, Joyride... And in the midst of this preparation, Tinashe has set out on a Joyride World Tour in which DARLA hopped on in Philadelphia last week at the TLA. Coming off of a long journey touring with Nicki Minaj for The Pink Print and Katy Perry this past summer/fall, Tinashe geared up for her biggest headlining tour yet. Although she's now performing at much smaller venues than the stadiums she graced last year, she was able to channel the elements of a big concert and incorporate them into her set for Joyride. Tinashe started off the night by performing two of her singles from the Joyride album, 'Ride Of Your Life' and 'Party Favors.' She then took it back to some of her older music including songs from her mixtapes Amethyst, Black Water, and Incase We Die, and the Aquarius album. Joyride is really a snapshot of where I feel I am in my life: traveling and going to new places, meeting new people, and doing new things. That was really the inspiration behind a lot of the new music. So for me, I just want people to be a part of the experience during the tour as well, and with the album when it comes out. I want it to feel fun and full of adventure, and it's exciting, it's dangerous, like they don't know which direction it's going to take. I've attended many shows at the TLA over the years, but Tinashe has been the first artist I've seen with multiple outfit changes and visuals to complement every song in one performance. She welcomed everyone into her world and showed what Joyride really means to her with behind-the-scenes footage of her videos and lifestyle playing in the form of a movie. 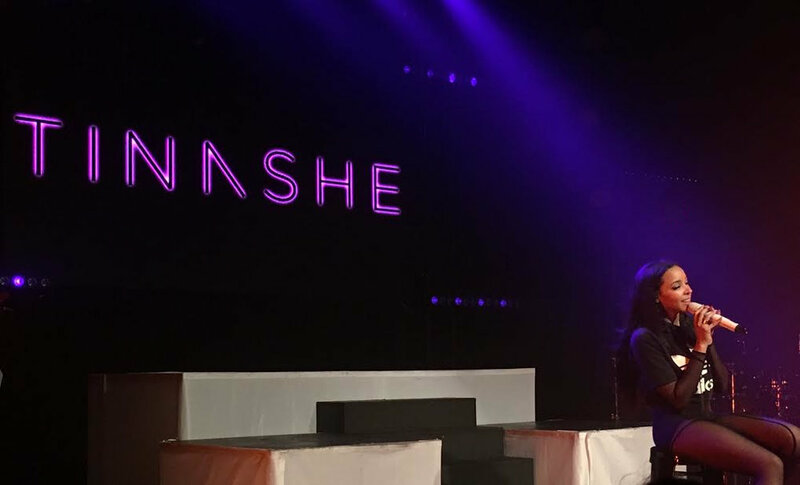 With this show production, Tinashe was able to really create the illusion that her performance was at a bigger venue while still maintaining an intimate vibe. Social media has become a huge part of artists' careers and because of it, it's no secret that Tinashe has a super dedicated, loyal fan base. #TeamTinashe has been around since she has gone solo after her former group "The Stunners" split up, and it continues to grow as she advances in her career. Her fans find real inspiration through the story of how she began and they admire her for being transparent and undeniably talented. As such a young artist who made the decision to take control of her career in her own way, from producing some of her own songs to directing some of her own videos, she has become a person many aspiring creatives can relate to. Throughout her life, Tinashe has been trained in various forms of dance which makes her an exciting performer to watch every time she hits the stage with her crew. Before the night ended at the TLA, each of her dancers introduced themselves by freestyling to one of their favorite songs as a graffiti visual with their names appeared on the screen behind them. The show was amazing; everything we wanted to experience and more... And it was so worth-it that fans are willing to travel to more cities to take the Joyride again before the tour is over. I'm excited for her album.... HELL YEAH I'm excited for her album! I'm actually going to see her again tomorrow, I'm ready for round two; she's going to be in Maryland... The number one thing [about Tinashe] is her music, man. I'm not a fan to be here for, you know, her looks... It's all about the music. She's dope, I love the whole vibe from her. Tinashe continues to make great music and do sh*t that might change your life; she inspires us to keep pushing and make the best out of what we have in order to turn our dreams into reality. If you're a Tinashe fan, or even just a fan of good music, I strongly suggest you make your way to the Joyride Tour if it hasn't passed through your city yet! Check out the remaining tour dates here.